BreakMentalDown: What number do I call to stop receiving phone books? What number do I call to stop receiving phone books? A phrase like this might seem outdated. No, not because people no longer bleed (especially not on things) but because, as anyone who has ever been suckered into delivering phone books knows, this will be the catchphrase of any delivery experience. 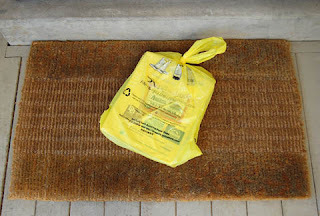 The name might change, but the truth still stands—delivering phone books is awful and will only become worse as they head further and further into their own irrelevancy. Phone books are largely a relic of the past and I (hopefully) will never have to help deliver them again as a fundraiser for my brother's baseball team. But that will never change those weeks in 1997 and 1998 when that fundraiser brought my mom, my brother and me into the indentured servitude that is phone book delivery. A phone book in its very rare non-bled upon state. For some wise reason, the phone book company decided it would be a great idea to deliver phone books door to door in February... in Minnesota. Anyone who has never lived in that barren wasteland, knows the average daytime high during that month and location usually hovers around absolute zero. On some of the “hot” February days, molecules can actually move. But those are few and far between. Those Februarys, we were the only molecules moving, because who else would. We had it set up where my mom drove the minivan, my brother walked the books to the doors, and I lived amongst a thousand ton pile of books, packaging the Yellow Pages, White Pages and local Yellow/White Pages into one bag. A sharp turn would cause the stack to tumble onto me, killing my organs and all life therein. But that actually might have been preferable to what I did do. Since nobody has probably looked at a phone book for several millenia, keep in mind as to how a phone book works. It is a whole bunch of useless information contained between razor sharp covers. Those covers, as their descriptor states, are razor sharp. This is not a good combination. This is a combination that causes massive paper cuts. And since we've established it was literally freezing in the van, I didn't notice the blood trickling down my hand. Need I point out that blood is red and White Pages are some non-red color. When my brother noticed the bloody pages and said that catchphrase I listed at the top, we both took a beat, looked at the bag and shrugged our shoulders. He delivered the book and we moved onto the next house. I delivered those phone books back in 1998, a crazy era when something as awesome as Google didn't exist. People needed phone books to actually make calls. 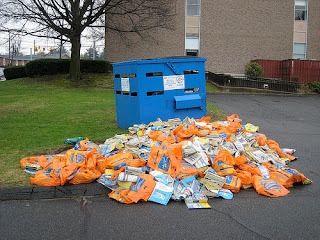 Nowadays when I walk outside and I see a bag of books propped up against my door, I don't recall those fine delivering memories, but I also don't toss it straight in the recycling either. I first remove it from the plastic bag and THEN toss it in the recycling bin. Our recycling guys refuse to take anything that's in a plastic bag. But they gleefully accept phone books. All in all though, my mom, brother and I worked four hour shifts for three weeks. I believe in the end we earned something like $80 for my brother's baseball team. The death of the phone book industry means kid's baseball teams won't see those slave-like wages for much longer. Who knows, they just might have to resort to asking parents for money. I know I would have much preferred that one. As phone books die out, I just wonder what kids will bleed on next. It definitely can't be phone books, but maybe Google will be the target of various A Positives and O Negatives. Us phone book deliverers can only hope.